Mohamed Salah has revealed that his wonder goal against Chelsea came from pure instinct – but admitted he needed a bit of luck for it to go in. Salah followed up Sadio Mane’s opener with a stunning powerful strike from outside the box, as Liverpool claimed a 2-0 win over the Blues to return to the top of the table. 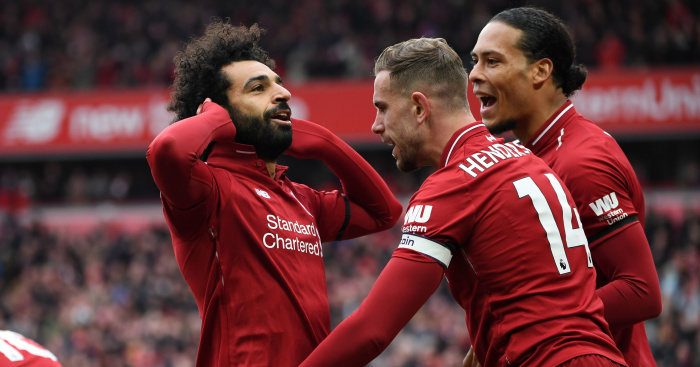 The Egyptian winger has now scored two goals in his last two Premier League games, stylishly ending a drought that had seen him go eight games in all competitions without scoring. On his goal, Salah revealed to Sky Sports: “I don’t think. I just feel. Salah celebrated with a yoga pose, which he joked about after the full-time whistle. The goal saw Salah move level with Sergio Aguero on 19 goals in the race for the Premier League golden boot. “Mane has a very good season, Firmino has a very good season, because also the attention means they have freedom. “I’m very happy for them. It also helps our team to score goals, when they focus on my side, the other side is free. I just focus on the team.